Lapel poppy as sold by the Royal Canadian Legion. For the past four years we have been observing the centennials of the various events that comprised the Great War, including the Battle of the Somme (July 1, 1916) and the Battle of Vimy Ridge (April 9, 1917). Today we mark the end of it: on the eleventh hour of the eleventh day of the eleventh month, 1918, an armistice went into effect, ending hostilities on the Western Front, which had thus far killed over three million people and wounded over eight million, all started by some damned fool thing in the Balkans. And, as everyone knows, the settlement that ended the war simply set the stage for the next one: the Treaty of Versailles was not as fair as Wilson had promised in his Fourteen Points, nor as punitive as it needed to be to ensure that Germany did not rise again. So just as the Great Famine of 1315-22 weakened the immune systems of a whole generation of Europeans, and made the Black Death of 1346-51 more virulent than it otherwise would have been, so also did the First World War lead directly to the Second, which then overshadowed it in cultural memory. 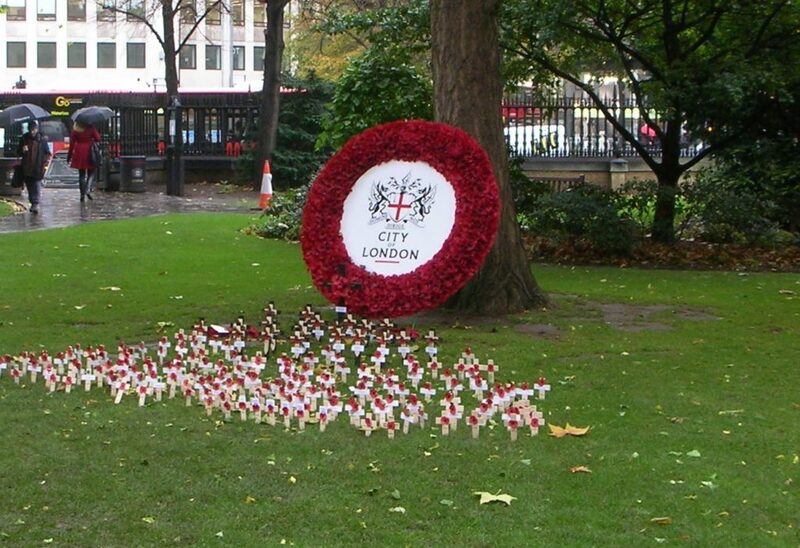 Garden of Remembrance, St. Paul’s Cathedral churchyard, City of London, November 11, 2010. This is especially true in the United States, which only joined the First World War in 1917, and only as a result of a potential threat as revealed by the Zimmerman Telegram. The United States also joined the Second World War “late,” i.e. over two years after Germany invaded Poland, but it did so as the result of a direct attack on its naval base at Pearl Harbor. The Americans played a significant role in defeating Nazi Germany; they played an even bigger role in the defeat of Imperial Japan, including through the use of the atomic bomb, which they had developed at great expense. So it’s only natural that, to an American, the Second World War means more than the First. It’s somewhat different in Britain and the Commonwealth. Once the United Kingdom declared war on Germany on August 4, 1914, all the Empire, even the Dominions, immediately followed, and fought, and bled quite profusely, for the sake of Britain’s allies on the continent. For well-known reasons, the war bogged down into a bloody stalemate where the advantage was always to the defense, and it soon became obvious that this was going to be a war of attrition – the first side to run out of men and materiel was going to be the one to lose, and this is more or less what ended up happening. Four years of mass industrial slaughter on the Western Front was deeply traumatizing, and gave birth to rituals of remembrance that Americans generally don’t share: the sanctification of November 11 (at first designated Armistice Day, and now as Remembrance Day), the wearing of a lapel poppy* in the run-up to this, the ceremonial placement of wreaths of poppies at war memorials on the day itself, and the two-minute silence at 11:00 AM. (November 11 may be Veterans’ Day in the United States, but memorializing the war dead is the function of Memorial Day in May, which derives from the Civil War. 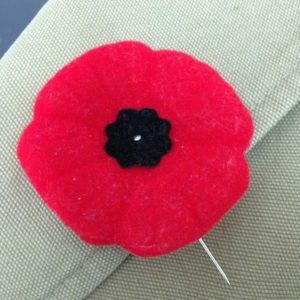 The VFW occasionally sells poppies, but the practice is nowhere near as ubiquitous as it is in Canada or the United Kingdom.) Of course, as with the United States, the UK and its Commonwealth also remember the Second World War, and probably to a greater extent, given Churchill’s refusal to make a deal with Hitler, his inspirational speeches, the evacuation of Dunkirk, the Battle of Britain, the Blitz, D-Day, and an unconditional surrender forced on a monstrously evil regime. 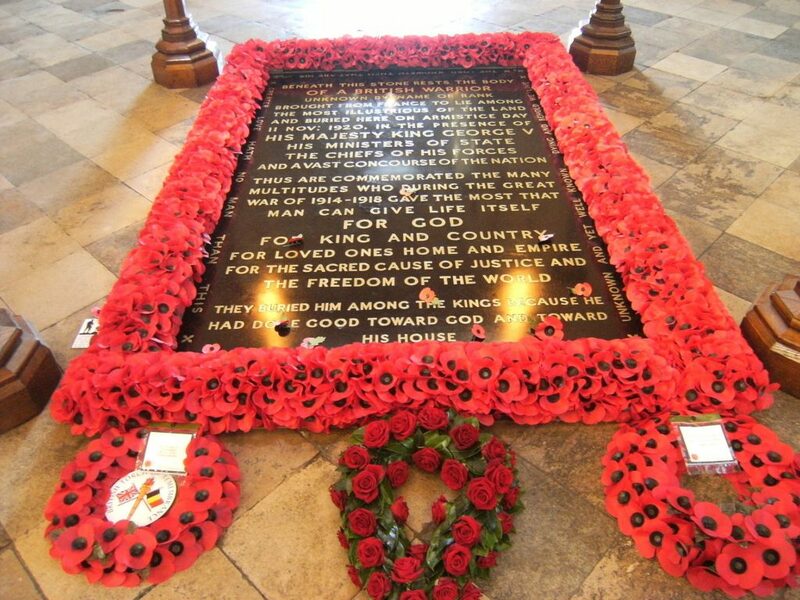 Tomb of the Unknown Warrior, Westminster Abbey. Wikipedia. 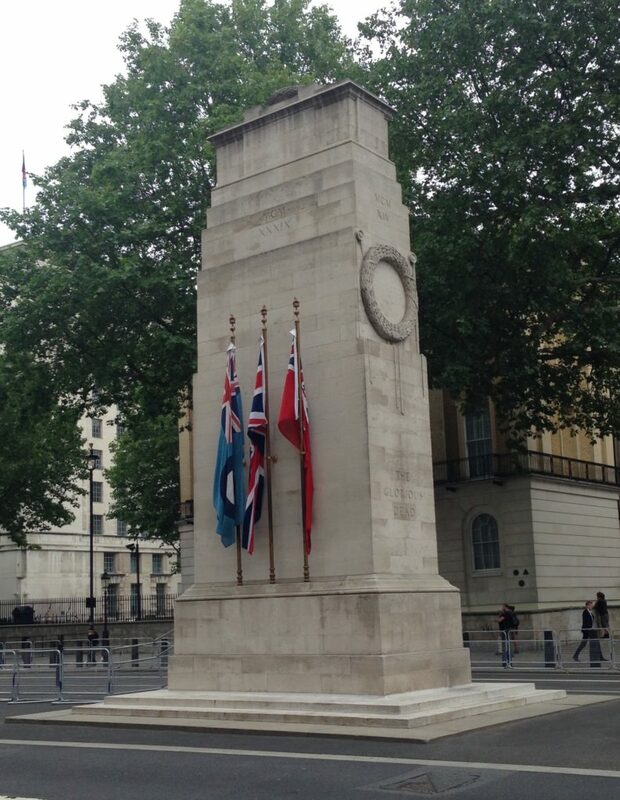 All the same, the First World War does loom larger in the Commonwealth than in the United States. And it deserves to be remembered, in both places. As pointless as all the killing was, the Great War turned out to be the Great Divide, and represented the real end of the nineteenth century and the birth of the twentieth. When the dust settled, four empires – the German, Russian, Austro-Hungarian, and Ottoman – had fallen, and many smaller nations won their independence. Communists took over Russia, and the stage was set for what Henry Luce called the American Century. Women were granted the right to vote in both Britain and the United States. Perhaps most importantly, the Great War shattered European self-confidence, and caused the mainstreaming of skepticism, pessimism, and “uncertainty” (one of the reasons, unfortunately, why Britain and France did not stand up to Hitler until it was too late). 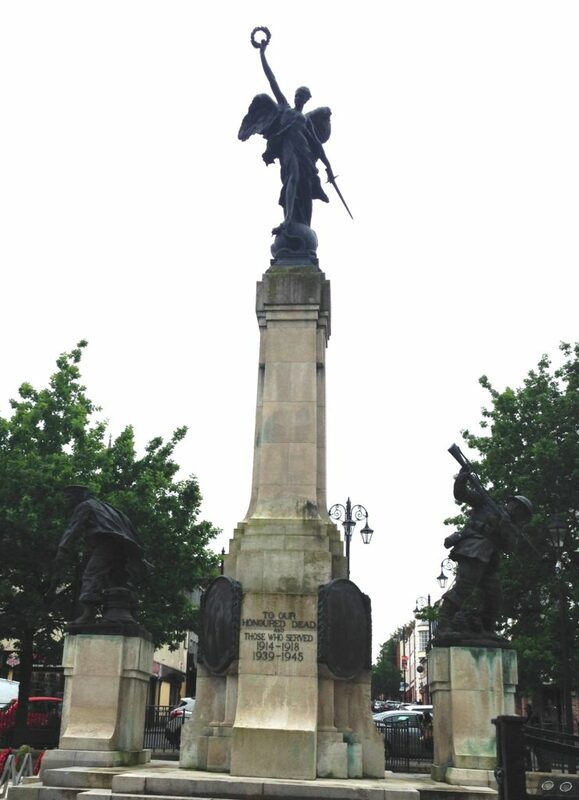 Diamond War Memorial, Londonderry, Northern Ireland. “The Great War” was overtaken in the national consciousness by the Great Depression and World War II, says Edwin Fountain, vice-chairman of the WWI Centennial Commission. The commission has been authorised by Congress to build the new memorial in Washington, DC, as well as increase awareness of the war. “The debate about the role of America in the world, the balance between national security and civil liberties, the place of women, African Americans and immigrants in our society – all those issues were vigorously discussed during WWI. 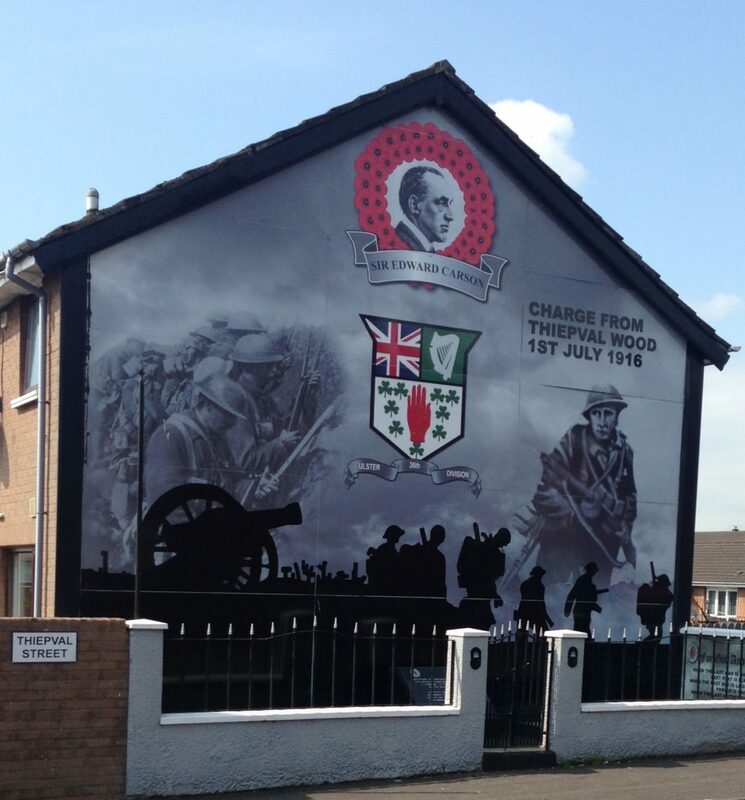 Gable end mural, Northland St. (arbitrarily renamed “Thiepval St.”), Belfast, Northern Ireland. At the same time, how the war was fought, and not just its aftermath, deserves closer attention too. If anyone knows anything about the Great War, it is an image largely created by Remarque’s great autobiographical novel All Quiet on the Western Front. Historian Dan Snow recently countered several myths about it, including that most soldiers died, that it was the bloodiest conflict in history to that point, that the upper classes got off lightly, and that soldiers lived in the trenches for years on end (in truth, they were cycled out regularly). Mural, Glenwood St., Belfast, Northern Ireland. The first world war was not just a grand tragedy. For the 67 million who fought, it was a sordid hellscape. Few of the ten million killed in combat died from a “bullet, straight to the heart”, as pro forma telegrams to relatives put it. Many more bled to death in no-man’s land, their wails lingering for days like “moist fingers being dragged down an enormous windowpane”, as a British lieutenant wrote of the Battle of the Somme. Traumatised survivors sometimes slept in open sewers, and begged for their mothers as superiors ordered them over the top. They guarded what slivers of humanity and dignity they could. At Compiègne today visitors can view silver rings from the trenches bearing initials (LV, MJ, SH or G) or four-leaf clovers; pipes with marks worn where teeth once clenched; a tube of insect-bite cream; letter-openers fashioned from shell casings, the names of yearned-for correspondents etched into their blades (“Marguerite”, “Mlle Rose-Marie”). A certain stoic humour also played its part. “I was hit. I looked round and saw that my leg had shot out and hit the fellow behind me (who got rather annoyed about [it])” wrote Charlemagne’s great-grandfather in his diary in 1915, just outside Ypres. The first world war happened because a generation of Victorian leaders took for granted the stable order that had prevailed in most of Europe for decades. They should have read their history books. Yet the war was also a tale of forces beyond the power of any leader, however well-read; of nations and continents not as trains on history’s railway lines, run by drivers and switchmen, but as rafts tossed about on history’s ocean, dipping at most an occasional oar into the waves. Fate was the real grand homme of the “Great War”. The assassination of Archduke Franz Ferdinand in 1914 would not have happened had his driver not taken a wrong turning in Sarajevo. The German army’s initial advance was halted at Nieuwpoort by a Belgian lock-keeper who flooded the surrounding marshlands. Political twists in Berlin, not crushing defeat on the battlefield, pushed Germany to sue for peace in 1918. I am chary of drawing “lessons” from history, but it seems in this case that history really does provide us with an instructive example. 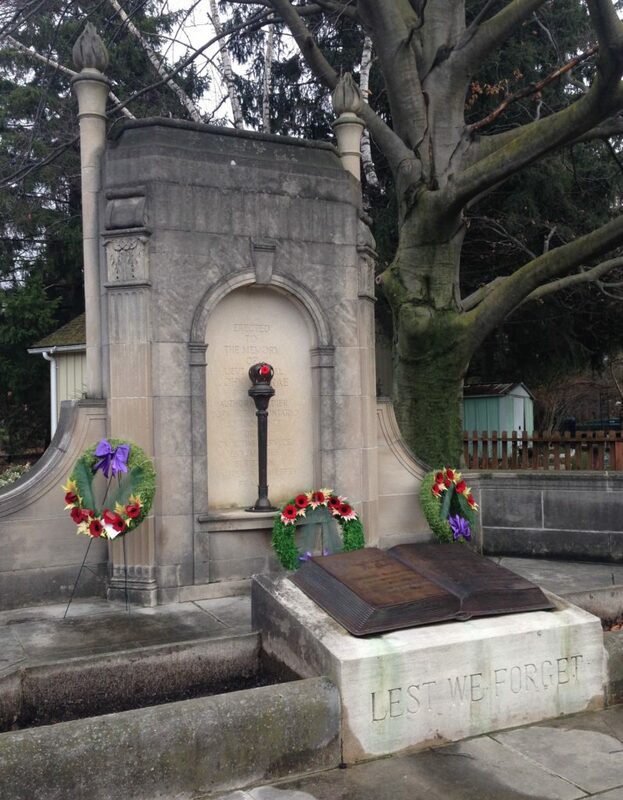 Memorial to Lt. Col. John McCrae, Guelph, Ontario, 2015. * The poppy as a symbol of remembrance derives from the poem “In Flanders Fields” by Lt. Col. John McCrae of Guelph, Ontario, who was serving with the Canadian Expeditionary Force and who died of pneumonia in January, 1918. He was by no means the only English-language war poet: the First World War produced a remarkable amount of poetry from the viewpoint of its participants, a product of the war taking place after the advent of mass literacy but before other forms of entertainment relegated poetry to a niche interest (see Paul Fussell’s The Great War and Modern Memory for more on this). I was pleased to see the memorial to sixteen representative war poets in Poets’ Corner in Westminster Abbey this summer, including the greats Robert Graves, Rupert Brooke, Siegfried Sassoon, and Wilfred Owen. Sadly, the poppy is “political” in some parts of the world, and not just because people believe that it justifies war. Among the nationalist community in Northern Ireland, the poppy represents “Britain’s War,” and thus represents British imperialism and British oppression. Nationalists, as noted, wear lilies in memory of the Easter Rising, and will generally refuse to wear poppies, even going so far as to taunt those who do. This entry was posted in British Empire, Canada, Commemoration, Ireland, Poetry, Twentieth Century, United Kingdom, United States, Uses of History, World War One, World War Two by jgood. Bookmark the permalink.